Something as simple as water, a resource that we all consume has become one of the most complex issues facing the state of California. Water sustains life; for people, animals, plants, food, and even our businesses. What makes water so complex is that it plays a crucial part in the way we live, especially during the dry summers here in the Central Valley. We may not realize it, but everything from the clothes on our backs, to the price of electricity that runs our Air Conditioners in the summer heat, depends on our access to water. California is facing challenges because we are uncertain of how long our valuable water resources will sustain the demand and usage of the water that we all need. 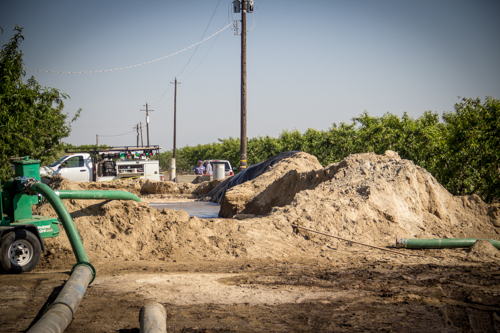 California has faced water issues before and we know that these problems are solvable. In order to solve the issues, we must first take a look and understand the problem in front of us. A “Drought” is a weather related phenomena that can be tricky to define. A drought does not have a set of easily identifiable and straightforward terms or features like wind speed for hurricanes and tornadoes. While drought is defined as a “prolonged period of abnormally low precipitation; a shortage of water resulting from this” The features and effects of a Drought vary throughout the world. For example, what is considered a drought in Bali (6 days without rain) would not be considered a drought in Libya (annual rainfall is less than 7 inches). Over the last three years, the state of California, and the Central Valley have fallen short on rainfall and snowpack. Our average annual rainfall for the Reedley area is 11.50 inches. The total rainfall for last November through March (our wettest time of the year) was only 6.31 inches. This puts is at 3 inches short of the average during those months. As of last week, the final snow survey revealed that we had 18% of average for May 1st. This snow runoff provides a third of the water for farmland and cities. On top of an extremely dry winter, 47.5% of all water caught in our reservoirs is sent through rivers and streams to the ocean to meet state and federal environmental requirements. Some may blame climate change, some global warming, while others claim our dry spell is due to the “Ridiculously Resilient Ridge” (a massive zone of high pressure in the atmosphere off the West Coast that acts like a brick wall, blocking Pacific winter storms from hitting California then deflecting the storms to Alaska and British Columbia). But the truth is, we don’t know the exact reason why California has experienced such dry winters. Just like the exact cause of our water shortage, we cannot accurately predict what next year will bring us. We do know that something has to be done to prepare for dry spells. The storage we have now was designed to prepare for these dry spells, and carry California’s cities and farms through times of drought. The storage facilities that we have in California are some of the best in the world. We have the infrastructure, designed over 100 years ago, to send water from Northern California all the way to Los Angeles. Two-thirds of California’s rainfall happens in the north, while two-thirds of the population and economy is in the south. We already have large reservoirs for most of the streams and rivers flowing in California. Building more of these reservoirs can contribute to solving the water shortage that we are facing but they do not solve the entire issue. The current reservoirs double as water storage, as well as flood protection for the areas surrounding them. That said they are capable of storing more water then the amount of runoff in the spring and summer. California has one of the most impressive and intricate systems of water delivery from its reservoirs. However, part of the problem is that the infrastructure for delivering this water is quite old, and it was designed for a much smaller population. The Central Valley Project (CVP), Federally funded in 1930, is the worlds largest water storage and transport system in the world. The State Water Project (SWP) constructed some of our major reservoirs in the 1950’s and 60’s. These two Projects are both intricately connected to the Delta located near Sacramento. The Delta is the heart of our water system. All water either to the ocean, or throughout the state passes through this area. Since the completion of these two large water projects, little has been done to keep up with the demand on our water supply from California’s growing population and agricultural industry. A temporary pond used during the development of a new well. Growers have to be prepared when surface water isn’t available. The amount of water that has been sent to the Central Valley has been cut drastically since 1992. From 1992-2009 there was a shift in priority for the use of this water. Over 3.8 million-acre feet of water from the Central Valley Project and the State Water Project has been re-prioritized away from cities & farms for environmental projects and environmental regulatory requirements. These water reductions resulted in farmers getting on average 35% of the water originally allocated to them. At the same time, they are expected to pay as if they were getting 100% of what’s allocated to them, but there is no guarantee that they will get water at all. The CVP was contracted to get 1.8 million-acre feet of water to farmers in this area. Since the steady decline in water deliveries, the Central Valley only got 630,000 acre feet in 2009. The Endangered Species Act (ESA) has played a role in the declination of water deliveries. The Delta Smelt and the juvenile Salmon population in the Sacramento San Joaquin Delta became part of the decision to reduce water deliveries to farmers. As part of the ESA researchers caught 300 Delta Smelt near the pumps that deliver our water. In 2013 The CVP was reduced to 20% of its original allocation, and the SWP was reduced to 35%. In 2014 farmers are being told to expect 0% allocation of water from these projects. These regulatory requirements are unfortunately failing California’s environment and handcuffing California’s water systems – preventing our reservoirs from protecting from flood and providing much needed relief during drought. California farmers are some of the best in the world. Even though there are many challenges facing them, there has been much good that has come out of this extreme situation. New technology has been used to help them need less water, have more impact with less water, and reduce waste. For farmers to survive generation after generation, they must adapt, take care of their resources, and continue to improve on their practices. There are none better at caring for the land and developing technology than our group of Summeripe growers. We have seen them use Irrometers to measure the moisture in the ground, use drip irrigation, and have an overall sense of how important it is to take care of what they have. Luckily for us in the Reedley area, we have a good water table below us to get us through a time where we don’t get surface water. We are praying for a wet winter, and for policies that will benefit the urban populations as well as the farmers who love producing the best food in the world.